Buy locally produced food to support our small, regional farms and preserve our agricultural heritage and traditions. It strengthens our local economy and reinforces the web that connects us to others within our communities. It safeguards our environment and lessens our dietary carbon footprint by reducing the number of miles our food has been shipped. Piedmont Environmental Council’s Buy Fresh Buy Local food directory is the ultimate resource for sourcing local food. Go to: http://www.buylocalvirginia.org. Shop at one of many local farmers markets. Get to know the farmers. Listen to their stories and learn their growing practices. Touch, smell and taste fresh, healthy and locally grown food. I say, “Meet a farmer, make a friend”. For a local listing, go to http://www.buylocalvirginia.org. For a statewide listing, go to: http://www.vdacs.virginia.gov/vagrown-july/pdf/frmsmkts.pdf or http://www.localharvest.org. Patronize grocers that sell locally produced food and request your favorite producers. For a list, go to: http://www.buylocalvirginia.org or http://www.localharvest.org. Dine at restaurants that include local food on the menu. Inquire about where the food on the menu comes from. Recommend your favorite local producers. For a list, go to: http://www.buylocalvirginia.org or http://www.localharvest.org. Join a CSA (Community Supported Agriculture). A CSA is a mutually supportive relationship between local farmers and community members with annual membership fees to cover farm production costs. Members receive weekly “shares” of the harvest during the local growing season which ensures them tasty, nutritious food and a deeper connection to their food source and community. For a list of regional CSAs, go to: http://www.buylocalvirginia.org or http://www.localharvest.org. Eat fresh produce in seasonal and learn to cook with it. Consuming local foods within season is the diet that nature intended and is designed to supply us with many of the nutrients we need for health and well-being. These most auspicious foods allow us to take in the terroir – or essence – of the land from which they are grown. For a seasonal availability chart, go to: http://www.vdacs.virginia.gov/vagrown/chart.shtml, or pick up a copy of one of our many regional food ‘zines featuring recipes and articles on seasonal foods, such as In The Kitchen, Flavor, Piedmont Virginian Magazine and Edible Blue Ridge,. The Weston A. Price Foundation (www.westonaprice.org) is a great resource for learning the art and appreciation of traditional food preservation and preparation. Or visit the Sustainable Table website at http://www.sustainabletable.org for a fusion of food advocacy and education, cooking methods and ideas. Alternatively, take a class in cooking with local food from Charlottesville Cooking School (www.charlottesvillecookingschool.com) or the Seasonal Cook (www.seasonalcook.com). Sign up for the EAT Local list serve to stay abreast of – and to post — current, local food issues and resources. Do so at: https://list.mail.virginia.edu/mailman/listinfo/sustcomfood. Go visit a farm. Attend a nearby farm tour and meet those behind our local food supply. While you’re at it, try harvesting your own food at one of the area’s many U-Pick farms and orchards. For a list of U-Pick farms and farm tours, go to: http://www.buylocalvirginia.org or to http://www.vdacs.virginia.gov/vagrown/index.shtml. Participate in a community garden plot at either Meadowcreek Park or Azalea Park through Charlottesville Parks and Rec. Call 434-970-3592 for more info. Or, collaborate with your neighbors or home owners association to start one in an unused community greenspace. For more information on community garden projects in general, go to: http://www.communitygarden.org. Get involved with an urban garden program, such as Quality Community Council’s Urban Farm Initiative. For more information, go to: http://cvilleqcc.com/Farm.aspx. If you have a yard, plant a garden of your own and replace chemical and energy-intensive lawns with edible plants (fruit and nut trees, berries, herbs and vegetables)! For more information, go to: http://www.foodnotlawns.com. For courses teaching permaculture and sustainable gardening, contact the Blue Ridge Permaculture Network (http://www.blueridgepermaculture.net). Better yet, visit Edible Landscaping in Afton and taste your way around their diverse supply of functional and edible plants. http://www.ediblelandscaping.com. Or, to hire someone to garden for you contact info@growingfoodandcommunity.org. If you don’t have a yard, learn about container gardening. Lots of foods can be grown in pots on patios and balconies and in windowsills. For consulting services, contact Growing Food & Community: info@growingfoodandcommunity.org. Learn the art of traditional food preservation techniques (such as canning, drying and fermentation) and take advantage of surplus fruits and vegetables during a seasonal glut. Resources include: http://www.seasonalchef.com/preserver.htm, http://www.canningpantry.com, http://www.wildfermentation.com, http://www.sacredplanttraditions.org, http://www.ext.vt.edu. Become an agricultural entrepreneur. Turn an old, cherished family recipe into a specialty food sensation by creating a great product using local ingredients and marketing it. Find out more by visiting the Virginia Agriculture & Food Entrepreneurship Program at http://www.vafep.org. Share surplus food and garden supplies with friends and neighbors in need or to area food banks and community kitchens like the Thomas Jefferson Area Food Bank (http://www.brafb.org) and the Charlottesville-area Emergency Food Bank (http://avenue.org/efb). Donate unusable yet perishable CSA shares by contacting the Charlottesville Community Food Project. Their website is: http://www.ccfp.wordpress.com. Get involved in community foods projects or start one of your own. Find out what initiatives are taking place and how to get involved by joining Transition Blue Ridge’s “Food & Agriculture” committee. http://www.transitionblueridge.org. Or contact info@growingfoodandcommunity.org for more ideas. Talk to your friends, family and neighbors about the importance of eating locally, the state of our current food insecurity and what options are available. Form a “support” group and, together, take the “locavore” challenge! For ideas go to http://www.eatlocalchallenge.com. Host or attend a dinner party with a local foods theme. Discuss where and how the foods were grown and compare the taste and vibrancy of these foods to processed and far-travelled foods. Not sure how to organize one, let alone cook up fresh, local produce and foods for a crowd? Contact Lisa Reeder, our local food and drink consultant extraordinaire at http://www.alocalnotion.wordpress.com. Host or attend a showing of a documentary on food production and supply issues and follow it with a discussion. Check out our area’s own “Meet the Farmer” cable television program featuring interviews with local food producers, buyers and consumers to hear what current issues are facing our local food supply and what initiatives are taking place. Go to http://www.meetthefarmer.tv. Good feature films to screen include “The Future of Food”, “King Corn”, “The Real Dirt on Farmer John”, “The World According to Monsanto”, “Power of Community”, “Peak Moment Television” and “Eat At Bills,” available from Netflix, by searching online or by special order from your local video rental. Join forces with others interested in discussing local food issues, initiatives taking place and how to get involved. Transition Blue Ridge hosts a monthly community dialogue about food (www.transitionblueridge.org). Express your concerns, ideas and opinions so that our local officials are aware that food security is an important issue. Support organizations that advocate for scale-appropriate agricultural laws like the Virginia Independent & Consumers Association (www.vicfa.org). Check out what is happening with the Virginia Food Policy Council by going to http://groups.google.com/group/VAFoodPolicy. Preserve our agricultural heritage and biodiversity by learning the practice of seed saving. Go to: http://www.southernexposure.com to learn about seed saving, to buy seeds and to get information on attending the annual Monticello Heritage Harvest Festival on September 12. Catch rainwater from the roof in rain barrels or cisterns to conserve precious water that can be used to irrigate the garden without taxing our water supply. Contact our local rain barrel guru, Brian Buckley, at brianbuckley4@yahoo.com or find them at the EcoShop in Preston Plaza, Charlottesville next to Integral Yoga (where you can also buy local produce!). Support organizations working to ensure a safe, nutritious and equitable food supply through volunteering and donating useful supplies and through making financial contributions. Volunteer opportunities abound at any of the aforementioned organizations and initiatives. Also find out about volunteer and benefactor opportunities for the new day haven and community kitchen serving the Charlottesville-area’s hungry and homeless (slated to be open this fall) by contacting info@growingfoodandcommunity.org. Learn and practice sustainable farming in the state of Virginia by reaching out to groups like the Virginia Association for Biological Farming (www.vabf.org), the Center for Rural Culture (www.centerforruralculture.org), the Southern Sustainable Agriculture Working Group (www.ssawg.org). Vote with your dollar. Remember, every local food purchase you make contributes toward building a safe, secure, healthy food system and supply. It’s a classic, but what a story. Spending all your day gathering sticks for a hot shower is just no fun. No fun at all. Mind you, anything that results in a hot shower (or even better, a hot bath) has to be considered a priority at Milkwood. So when Nick finished converting the old ‘Sunbeam Sheep Shower’ structure (basically a new-fangled sheepdip) to a shower block with a little wood-fired, home-made firebox thingamy to heat the water for the shower and the bath, that’s what we did. Lots of stick-gathering. The romance of wood-fired hot water quickly wears thin, however, if your water-heating system is not terribly efficient. Because this means the system requires a fair deal of wood to heat the water, which therefore releases a corresponding amount of CO2. And also results in lots of stick gathering. 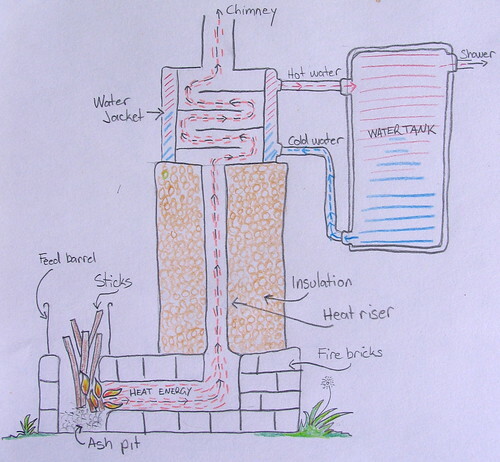 So Nick went searching for the most super-efficient, super-simple and super-funky heating system idea he could find, which could then be converted to a water heating system. And thus we discovered the glory that is the Rocket Stove. 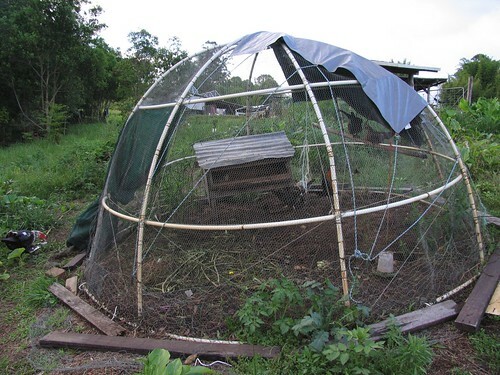 Maybe you’re already familiar with that classic Permaculture tool known as the Chicken Tractor / Chook Dome system. No? Awright – in a nutshell: In this context, a Chicken Tractor is any structure that can be moved from place to place in a garden with a bunch of chickens housed in it. The chickens living in the tractor do what chickens are so good at: scratching up the soil and turning it over, making short work of any greenstuff to be found, and spreading their manure the length and breadth of the space available to them (not to mention producing eggs and more chickens). By moving the tractor regularly you are left with a series of spaces for garden beds each the shape of the tractor, and each with the soil nicely prepared, the weeds and grass all pecked out, and a goodly amount of chook poo thoughtfully spread. Mulch each new area heavily, and plant away – a great way to start a vegie patch, or a food forest. Rich soil with plenty of organic matter, from regular additions of compost, soaks up rainwater better than barren, compacted dirt that shrugs it off. No garden should ever flash bare dirt because a layer of mulch over the soil does so much: It insulates the soil from temperature swings, reduces weeds and feeds the soil ecosystem as it breaks down. But one of its greatest powers is to prevent water in the soil from evaporating under the hot sun. Many attractive designs are available—in shapes to fit tight spots (and a range of prices). For all you need to know when buying a water barrel, see 5 Things, Page 2. A century ago, many houses had cisterns—big tanks to collect rainwater. The idea is coming back. A 2,500-gallon model has now been installed as part of the sustainable landscape surrounding the Smart Home at the Museum of Science and Industry (msichicago.org). And Lake Street Landscape Supply in Chicago (lakestreetlandscapesupply.com) is trying out a new product: A collapsible bladder that can tuck under a porch or crawl space and can hold 1,000 gallons. Cost: about $3,000 installed. Any low spot that stays wet for a while after rain is a good candidate for a rain garden—a bowl-like depression where water from gutters can collect and soak in slowly. Rain gardens usually are planted with native plants with long, deep roots that can absorb a lot of water from the soil and rarely need watering beyond rain. Read up before you start digging a rain garden (find many links at raingardennetwork.com). Basically, it’s a wide drainage ditch designed to slow water down. A bioswale is planted with deep-rooted, wet feet-loving native plants. The ones Jaime Zaplatosch of Chicago-based Openlands (openlands.org) chose for the Smart Home bioswale included prairie ironweed, swamp milkweed and sweet black-eyed Susan. Opt for permeable paving. A greener option for walks, patios and driveways is permeable paving, with spaces for rain to drain through into a deep layer of crushed rock where water can collect until it soaks into the soil. Belgard Hardscapes (belgard.biz) is among companies with an expanding line of permeable pavers. And Ozinga Concrete of Mokena has FilterCrete, a ready-mix concrete that cures full of little holes to let water percolate down to be filtered by microorganisms (ozingagreen building.com). Use soaker hoses. Wind these porous rubber hoses between your plants to dribble water slowly right to the soil without wasting as much to evaporation. Cover the hoses with mulch and you’ll never know they’re there. Another option: drip irrigation systems, which are even more efficient than soaker hoses. Many companies offer kits for beginners (provenwinners.com, leevalley.com). Zone your garden. Gather the thirstiest plants near the faucet, so you can run a soaker hose among them (maybe from the rain barrel) or water them by hand. Farther out, plant durable, drought-tolerant perennials, shrubs and grasses. Do a leak check. Scout for drips, leaks and cracks. Replace rubber-hose washers to keep connections tight. Use containers wisely. Containers near the house are a good choice for your thirstiest plants. But you can reduce containers’ water needs in several ways. First, buy big pots. Use potting mix that holds moisture but drains well. Because porous materials such as terra cotta let water evaporate through their sides, slip a plastic pot (with drainage holes) inside. And always mulch the surface of a container. Bill Doeckel, manager of innovations for Ball Horticultural Co. in West Chicago, recommends MagniMoist liners for pot bottoms that hold moisture but allow drainage (thinkmint.net). Water-absorbing crystals that allegedly reduce watering? Mostly useless, scientists say. Pick up a broom. Sweep rather than use the hose to clear walks and decks. Think less lawn. “I’m not saying get rid of the whole lawn,” says Shirlee Hoffman of Openlands. “Reduce it by a quarter.” That not only saves water, it reduces fertilizer usen and emissions from mowers. Don’t overwater the lawn you have. Pay attention. The simplest way to water less is to make sure it’s really necessary before you reach for the watering can or sprinkler. Don’t water on a set schedule. Get a rain gauge so you know how much rain has fallen. And check, with trowel or fingertip, that the soil is dry 3 inches down (2 inches in pots) before you water. .
Water deeply. When you do need to water, let the soaker hose run long enough so that the water goes deep, to invite roots of plants such as lawn grass and perennials to grow far down into the soil. In the vegetable garden, plants such as tomatoes don’t like to seesaw between wet and dry. So mulch and check frequently to maintain even soil moisture in the root zone.